www.xrtwo.com • View topic - mk2 1.4 Ghia as a daily driver. Post subject: mk2 1.4 Ghia as a daily driver. I've found a mk2 1.4 5 speed Ghia in a car sales and was considering trading in my Daily driver (Citroen C2) against it and then swapping all the good bits from my 1.1 Ghia and then flogging that off and using the 1.4 as a daily driver, the 1.1 Auto just isn't a pleasant enough drive to be used as a daily driver. Your thoughts gentlemen, should I keep things as they are and use the C2 as a daily and the 1.1 Ghia as a weekend car or buy the 1.4 and use that as an only daily car instead? Don't steal!! As the government doesn't like competition!! Post subject: Re: mk2 1.4 Ghia as a daily driver. Why not, they are a pretty good little engine and a mk2 is more interesting to drive over a C2 any day of the week (if its a none sporty one). Just make sure you can keep on top of corrosion if you're intending on keeping it long term. Thanks for the reply Ross, I've just checked the DVLA MOT site and it has a lot of advisories and the main thing being corrosion around the rear floor and suspension areas, so not sure what to do really, I don't think I'll get enough money for my C2 as they want £1300 for the Ghia which is a lot of dosh for a tatty example, unfortunately I don't have a lot of spare cash to add to the trade in price. Would it be worth keeping an eye out for a more solid one for sale privately to lower the cost? Can you cover the cost in the short term between buying one and selling your C2. An L model might sell for slightly less than a Ghia and is a shell drilled in the same places (high spc cards/side mouldings etc). My Xr2 and the wife's 1.1. The 1.1 is a nicer place to be to be honest. Although the power of the Zetec Xr2 is really nice. I'd quite happily drive a 1.1 all day long as a daily driver. I've not been tainted by modern cars over the years. My only issue with a MK2 as a daily driver is the following. 1. You WILL get a lot of people asking you about it at the lights and in car parks. - "Is it for sale?" 2. Some parts are getting harder to get now. So getting things off the shelf isn't always an option. 3. Heated front windscreen in the wintertime is a luxury that's a pain to live without. Other than that. I have no issues driving either our 1.1 or my XR2 in traffic. Don't get wrong Jason my 1.1 is a lovely engine and actually goes pretty well once it's bouncing along, it just comes down to the damn auto box again, when you take it out for a drive at the weekend, the window open, stereo on and you're just enjoying the drive then it's actually pretty nice to be in, now although I only do five miles to work and if I'm honest it's not that bad a drive and there's no fast roads (dual carriageways or motorways) but it's just sometimes trying to get past either a cyclist or tractor on a windy road with blind bends isn't much problem with the C2 but the poor old fez struggles a bit on take up when you put your foot down to overtake, to be honest I'll probably just keep the cars I've already got, the C2 is a diesel and is dirt cheap to run, the other problem is I deliver building materials to sites and get shitted up to the eyeballs and my C2 is so dirty inside I don't really worry what happens to it but I wouldn't want to use the fez all the time for work as it's bloody immaculate inside and I don't want to ruin it. I'm of the mind it's to be used. I'm not one of these people who sits a car in a garage and pulls it out every Sunday to add another layer of wax before pushing it in for another week. Of you're not happy with the auto box. Change it to a manual. Like we've discussed on other threads about converting from auto to manual, getting the parts is proving difficult locally and obtaining them via the internet is either fruitless or expensive (I know you've offered me a lot of the parts which I thank you for) but once you've added on carriage charges to certain items you've nearly spent almost double and then there's actually doing the job, my back wouldn't cope with doing the work and paying my local garage to do the job would probably cost more than what the car is worth (according to everyone on Facebook Fiesta sites ), I'm finding it almost impossible to find a decent bonnet, a few pop up now and again but no one wants to send them and I ain't driving up north to collect one (where they all seem to be) I even had a guy from Bulgaria offer me one but can't be bothered to give me a price. 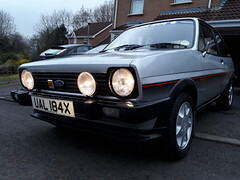 Anyone thinking of using a mk2 Fiesta as a daily driver now... is either French (peasant) or needs psychiatric help haha! Find a nice one and keep it for weekends / dry days/ fun. I was still driving old bangers everyday up until about 6 years ago, one of those was a mk2 1.1 Ghia manual (I think it was about 2010), the only reason I stopped was because my misses gave me her newer diesel Fez, I'd happily go back to another mk2 (or any old car come to think of it) as a daily if it had "drivability" and was reliable, I just don't think my auto is that sort of car to be able to keep up with the pace of modern driving, a 1.4 5 speed I believe would, the auto isn't the easiest car to park either due to not being able to control it very well due to a stiff throttle and that is due to the overly long link bar that goes from the gearbox to the carb and before anyone says your throttle cables knackered, that's been changed and it's still the same, so it's all or nothing with the power when you're trying to park. The Fiesta has a cracking little heater, it depends what you want out of your daily driver. I found a motorway blast in my Zetec converted Mk2 to be just what the doctor ordered after a day of meetings and office politics. I swapped it out for a modernish estate to be able to carry large house renovation materials and to protect it from rust, nothing to do with getting tired of it as a daily. Maybe I'm in your peasant bracket though Owain, I do enjoy a bit of cheese and wine from time to time. It really depends on your daily routine and how sensitive you are to certain things. For me it doesn't work. The car is too loud on the motorway, the seats lack back support, the suspension is too harsh, it doesn't coast well in neutral, no AC, the engine gets dirty because there is no underbody paneling, etc, etc.... Plus, it's very stressful to think that if some one were to hit me, I'd have a very hard time finding original replacement parts. I like the Fiesta for ocasional pleasure drives only, preferably on smaller roads. IMHO the shelf life of a car as a daily is around 20 years. After that parts start to become rare and it's more stressful than pleasurable. If I drove only a couple of miles each way and had garage parking at work, then it would work. But in that scenario any car would, really. True enough, if i was rich id have one stripped and zinc plated and then properly sealed before painting.